A tranquilizing tea that is rich, creamy, smooth and refreshing, with a delicate jasmine flower scent. The tea leaves are rolled into beautiful pearl-like shape. When steeped, the "pearls" slowly unfurl into long needle shaped leaves releasing its light and wonderful aroma. 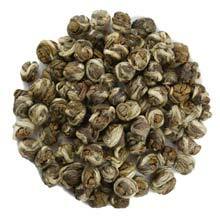 The tea bud is slightly larger and has more white down as compared to standard grade Pearl Jasmine.